In Song For Marion we see how true love will last a lifetime and will change you when you least expect it. Arthur (Terence Stamp) and Marion (Vanessa Redgrave) are an elderly married couple who are quite clearly the centre of each other’s world. 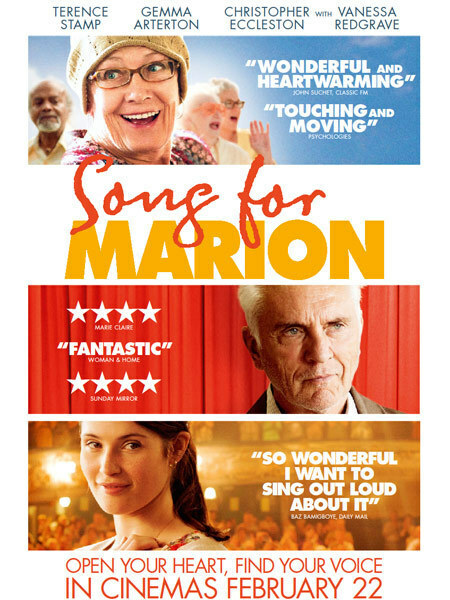 Marion is gravely ill and her greatest thrill in life is participating in a choir of pensioners, led by young music teacher, Elizabeth (Gemma Arterton). As Marion gets weaker and weaker, Arthur feels himself drifting towards this quirky group of people and singing turns into his unlikely coping mechanism when his beloved wife leaves this world. Song For Marion is promoted as being a film which everyone can find relatable. Well, this is pretty much true because it appeals to you if you are a husband or a wife, a father or a mother, a son or daughter, a grandparent or a grandchild. The only thing is that this doesn’t necessarily mean is that it will be everyone’s cup of tea. The film is actually quite confronting as it brings our mortality into perspective. The very morbid thought that you leave Song For Marion with is that the day will come when you lose someone you love and will have to deal with it. It is a very morbid thought and one which you don’t want to think about too much because it is really a very depressing one. It is no surprise that this film is very teary and sad in parts. On the other hand though, there are some very funny moments throughout the film. It doesn’t make what is depressing about the film any less depressing, but it saves Song For Marion from being just being a confronting film. The members of the choir are really very funny. There is beauty in the way that the OAPZ embrace everything which they do and find no negativity or protest. Their rendition of “Ace Of Spades” by Motorhead is especially funny. The script is very well written by director, Paul Andrew Williams. Although Song For Marion is quite predictable and does have the expected clichés of a film like this, these clichés aren’t made overtly obvious. Nor is it corny at all. The script has just the right balance of everything to make it naturally emotional as though it isn’t even trying to be. Terence Stamp is truly wonderful in his role as the seemingly grumpy Arthur. His performance is very subtle, yet so moving and beautiful. His performance is done more through what you see on screen rather than what he says. Vanessa Redgrave is also just divine as Marion. The chemistry between Stamp and Redgrave is brilliant. They really seem like a couple who have loved each other for so long, and even though they have their tough moments you can see how raw and natural their love is. Gemma Arterton is lovely and Christopher Eccleston is also very good. Orla Hill, who plays Arthur and Marion’s granddaughter is gorgeous and her youth and bright outlook on life is so endearing. Song For Marion is wonderful because it is not a complicated film, nor a forced one. It just flows so naturally with waves of emotion and laughs in all the right places. It is one of those films that makes you appreciate the ones you love because you don’t know how long you will have them for.